The annual payment required to pay the principal and interest due on a $1 loan for a specified repayment term at a specified interest rate.Before the widespread availability of computers and extremely affordable financial calculators,it was common to use mortgage constant tables to calculate monthly payments. 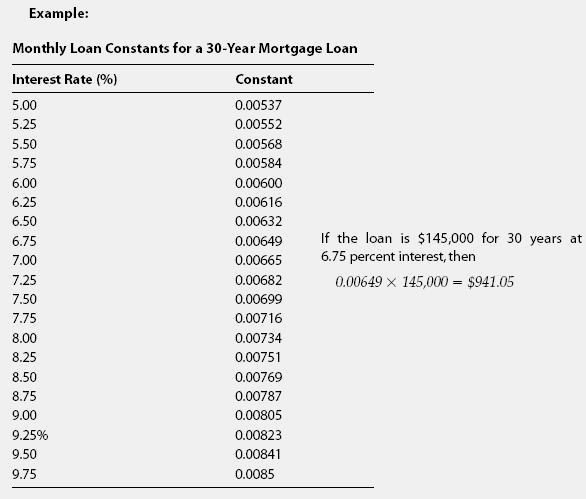 One would refer to the table for the proper loan term, such as 30 years, and then within that table find the loan constant for the anticipated interest rate. See the following example. The constant is the monthly payment on $1. To find out your own monthly payment, you multiply the constant by the number of dollars in your loan, and the answer is what your monthly payments would be.